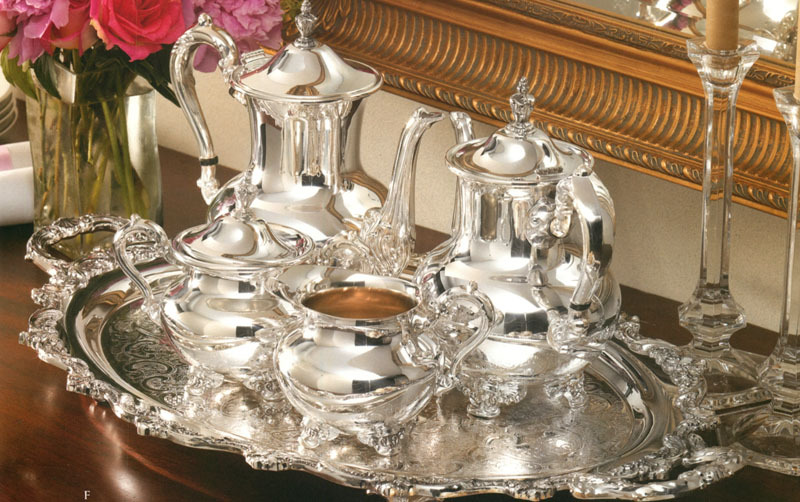 Fine sterling silver and silverplate is often a prized possession in many households. For others though, the thought of upkeep and maintenance prevents them from owning silver altogether. In truth, as long as a few simple rules are followed, owning silver can be a pleasure rather than a burden. It takes only a little tender loving care to keep silver looking beautiful year after year. A very soft polishing cloth to use with your silver polish. A quality silver polish. We recommend Hagerty or Town Talk Silver Care Products. Mild dishwashing liquid that does not contain lemon as lemon tarnishes silver. A flatware chest, wraps or caddy for storing your silver preferably with tarnish retarding treated silver cloth or other tarnish retarding products. Use It! The best way to prevent silver from tarnishing is to use it. This prevents any oxidation build up allowing tarnishing to occur. Wash silver by hand with a mild detergent (that does not contain lemon) with very warm water. Hand-dry silver immediately after washing with a soft towel. At the first signs of tarnish, polish silver with a quality silver polish, using a very soft silver polishing cloth and wiping in one direction, not in circles. Never let salt stay in contact with silver for longer than necessary as salt can pit and cause permanent. Be sure to wash silver immediately after each use as the longer food is in contact with silver, the faster oxidation will occur. If silver is used for displaying any fruit or flowers, keep the display fresh, as when vegetation decays, an acid is produced that may cause damage to silver. Never use chlorine bleach as a cleaning agent on silver as chlorine can cause permanently discoloration. Even airborne bleach fumes cause a risk to silver. When storing silver for any extended length of time, place in a flatware chest, wrap or caddy lined with flannel or a tarnish retarding treated silver cloth. The more air tight, the less silver will tarnish over time. Never store silver in contact with stainless steel, as this can also cause corrosion of silver. Never use newspaper to store silver as newspaper contains sulfurs which speed up the tarnish process and the ink may cause damage to the plating on silverplate. Never store silver using rubber of any kind, such as rubber bands. This may seem like a good idea but rubber is considered a deadly enemy of silver and can cause great damage. Do not store silver using felt or chamois leather as both contain hydrogen sulfide, a tarnishing agent. When handling your silver between uses, always wear cotton gloves as acids, oils, and other chemicals transferred from your skin may tarnish or even damage silver over time. Although silver is often considered to be very special only to be used for holidays and special occasions, bring it out and use it often. This can actually keep it brighter longer and you will find that only rare polishing touch ups are needed to keep it looking its best. Don’t fret over the small scrapes and scratches that are left behind on the silver from normal and frequent use. These actually help give your silver the patina that makes antique silver so desirable! Always use the best products to care for your Silver. Find the widest selection of care products all in on place at NancySilver.com.